A friend came over tonight - I guess this must be the first time we've had dinner guests since the baby was born in late November! She offered to bring a soup that she had made, so I just made a main course. It's been about three months since I've made risotto, and I have been thinking of making it for a while. I made my "conference call risotto" (see my May 2006 description), using red wine and, in the last few minutes, baby spinach leaves. I mixed in ground black pepper (barely; I ran out! 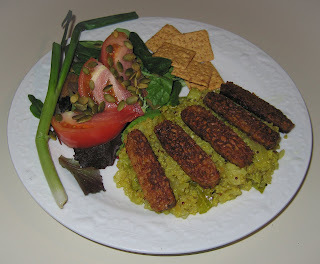 ), Himalayan salt, vegan Parm! "parmesan cheese", and a little bit of Earth Balance margarine just before serving - and we all loved it. My friend's soup, made with a number of vegetables and orange lentils, then pureed, was excellent! I really liked the Meyer lemon that she brought for enjoying with the soup. It was a fun dinner with a lot of good conversation. Tomorrow, we are attending the vegetarian society's first potluck in the new year. It will be our baby's first party that she will go to! 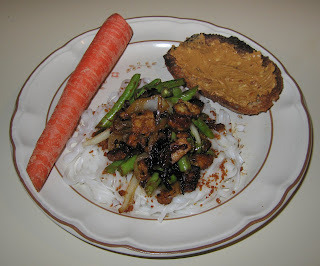 We had some green beans to use up and I was in a bit of a mood for rice noodles. 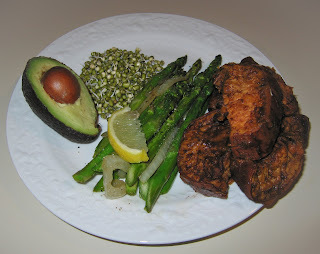 I came up with an idea for a dish which came out more tasty than I had expected! I sauteed over medium-high heat, using a garlic grapeseed oil that I just opened and about a half of a sweet onion, sliced into thin half moons. I diced half of a jalapeno pepper and added just a few pieces, as well. As the onion started clearing up a bit, after just a minute or so, I added a third of a package of tempeh, cut into cubes of size approximately 1/4". As the tempeh browned, after maybe 5 minutes or so, I added several handfuls of green beans, cut into approximately 1" lengths, the rest of the jalapeno (rationale: get the pepper's heat into the oil but leave most for later in the cooking so that those pieces remain fairly intact), and a bit of diced ginger (maybe 1/4 teaspoonful). I cooked just a few minutes, letting the beans get brighter green but not browned. I added a tablespoonful or so of soy sauce in the last 1/4 minute. I served over briefly boiled rice noodles. I sprinkled some garlic gold nuggets on, and also served some prairie bread, toasted with Earth Balance peanut butter (it has healthy flaxseed in it!). 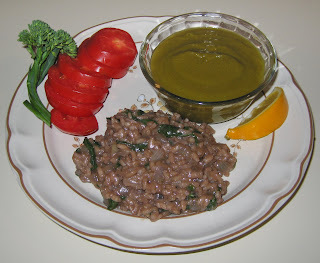 I came up with an idea for a rice-lentil pilaf. I chopped a quarter or so of a small onion, as well as a third of a bell pepper, into 1/4" cubes. I measured equal parts (half of a small six ounce soy yogurt container each) of brown basmati rice and French green lentils, and three times (i.e., 1 1/2 containers-full) water. In a sauce pan, I started the onion sauteeing in madadamia nut oil over medium heat; less than a minute later, I added the rice, and kept stirring. 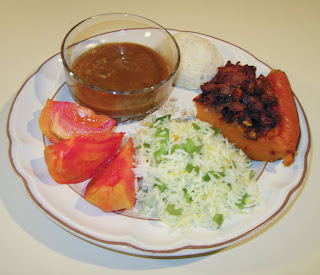 As the rice started clearing a bit, maybe in a minute and a half or so, I added the bell pepper (and wish I had some jalapeno to add, as well as cumin seeds, both of which I'm out of), stirred for another half minute or so, then added the water, a vegan bouillon cube, and the lentils. Normally, brown rice is cooked with a 1:2 ratio of rice to water for 50m or so, and the French lentils 1:3 / 30-45 minutes. I went with a 1:3 ratio, which was good, though the dish could actually have used even a little bit more water, surprisingly. I let it cook for about 45 minutes on a low, covered simmer, and that seemed to work out fine. I served it with some salt, chili powder, and maybe a half teaspoon of dried thyme. I also made a simple jerked okra dish by cooking in a little oil on a cast iron pan about 15-20 okra fingers, cut in half lengthwise, along with a half onion cut into maybe 1" long slivers. I mixed in some salt and jerk seasoning. My wife picked up for me some Follow Your Heart brand cheddar style vegan cheese. My favorite cheese is Scottish Sheese, but it's not available locally. I served a slice of the vegan cheese atop baby spinach leaves and pita crisps (my wife doesn't generally eat non-tempeh soy products and never liked cheese anyway, so her plate missed out on the cheese). It was a good dinner! Today, we had a birthing center appointment at 5p and had hoped to get dinner out before an intriguing film (The Visitor) and discussion. We ended up not having enough time to eat so went straight to the movie, and when we left after 10p, it seemed that any restaurant that we wanted to visit was closed when we tried calling. 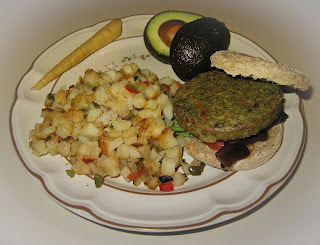 This simple dinner reminded me a little of the kinds of meals I might have put together in college. I thought it was filling and reasonably good, but certainly not particularly interesting. I thought I would finish up the Rao's marinara sauce I had left from Friday's dinner, and make another Cencione pasta dish. 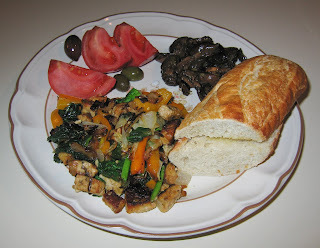 I sauteed small pieces of tempeh and onion; when the tempeh was lightly brown, I added small chunks of bell pepper and a little marinara sauce, as well as a little crushed red pepper and dried Italian seasoning, and reduced the heat from medium high to medium low. I cooked for just a few minutes, then added some salt and served over the pasta. 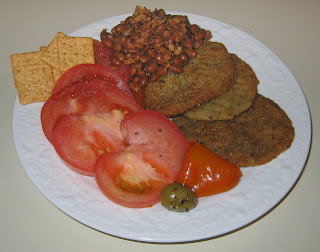 I also made some Tuscan-style beans; simply sauteed in a little olive oil for a few minutes, they really sparkled (really! some of the best green beans I've had!) with some lemon juice, salt, and freshly ground black pepper. 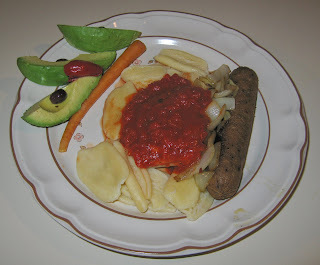 For tonight's dinner, I made a simple saute of plantain, onion, Field Roast Grain Meat Company Italian artisanal vegan sausage, and zucchini, along with a bit of jalapeno. As finishing touches, I added some salt (I purchased a week or ten days ago some Himala Salt that is supposed to be one of the purest salts, from the Himalayas, and have been enjoying using it), rosemary needles, and tarragon. It came out well! 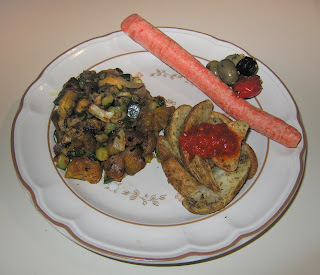 I also heated some Alexia Foods' rosemary-garlic potatoes and served them with a dollop of warmed Rao's marinara sauce. Last night, we picked up this week's soup that we purchase from this talented soup-maker, an Indian dhal ("Indian Yellow Split Pea and Pumpkin with Garlic, Ginger, and Black Mustard Seeds"). 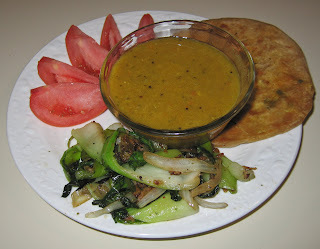 I heated some prepared frozen stuffed Indian flat paratha breads that were stuffed with grated radish, and made a simple baby bok choy dish with sauteed bok choy, onion, jalapeno, salt, and dried Italian herbs. 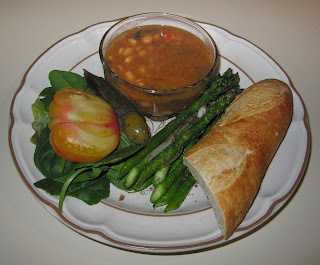 We're so lucky to have found out about the soup maker - her soups are so good! Today, I stopped at A Southern Season, a local gourmet store that I visit once in a while. My wife had mentioned that they had signs up that the whole store is on sale, which I thought they only did each summer. I found there Rao's marinara sauce two-for-the-price-of-one. I've always wanted to try their sauces; from a restaurant in New York (and Las Vegas), their sauces seem good and simple, but are always expensive. (The marinara sauce, for example, has imported Italian tomatoes and olive oil, sweet onions, fresh basil, fresh garlic, crushed black pepper, salt, and fresh oregano.) I also bought Cencione pasta, shaped like flower petals. I didn't want to embellish the sauce at all to appreciate the as-is flavor of it. I simply served it, gently and slowly heated, atop the pasta, with Field Roast Grain Meat Company Italian artisanal vegan sausage, cooked with very little oil on a cast iron pan. Dinner was very good! The sauce was quite tasty, though I'm not sure if it is better than locally-made Thomas Gourmet Foods' marinara sauce. I liked the pasta; it is firm and chewy. Yesterday was the last session of one of my photography classes. We also had a doctor's checkup visit for our baby before class, and both baby and Mommy came to my class. While my wife shopped, I kept the baby with me in a sling, much to the delight of all! My wife, our baby, and I went out to eat after class to nearby Panzanella, where I got another of their delicious pizzas with their vegan pesto sauce and artichoke hearts & sundried tomatoes, and my wife got a tasty pasta dish. For tonight's meal, I was able to put dinner on the table fairly quickly as I had, from Whole Foods, maple sweet potato (sweet potato, maple syrup, cinnamon, salt, and pepper) that I just had to warm. It was pretty good and I should try to make something like this. I also grilled some asparagus and onion on a cast iron pan. Avocado and sprouts rounded out the meal. We were at my parents' last night watching the presidential inauguration. We had planned on going out to some celebrations, but we had snow - for the first time in a few years! - and several events were postponed. We ended up staying at my parents' home and enjoying some dhal lentil soup, rice, and Indian breads. I've been off work since our baby came three weeks early - I had several classes, including one for children ages 5-10, underway, when she arrived. Today I took on some photography workflow tutoring in the afternoon; it went on till the early evening. I rushed home but luckily my wife had had a little snack and her feeding schedule with baby allowed me a little time to get dinner ready. 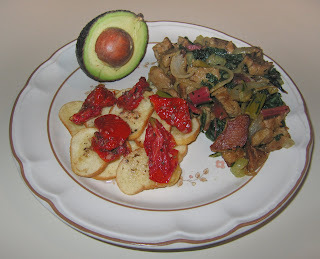 I prepared what turned out to be a delicious combination dish with acorn squash. I love winter squashes and almost always bake them. 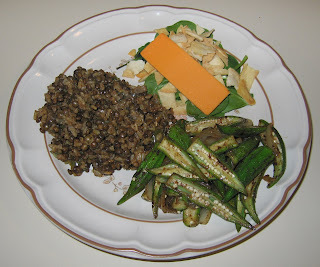 They're very nice in risotto, but the squash is difficult to peel and cube. However, I found good organic frozen cubed squash, and used it today. 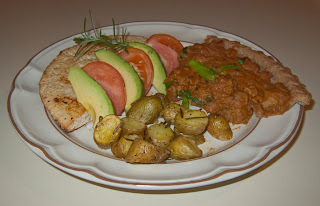 I made a simple saute with onion and herbs - wow, it was good! 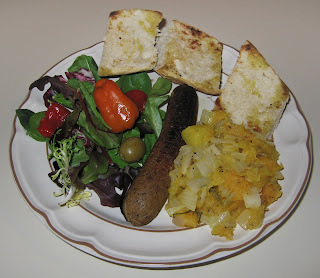 I served it with a Field Roast Grain Meat Company apple-sage artisanal vegan sausage, French baguette, and salad. Yesterday, we had a 5p appointment at the birthing center, just down the road from Sage Cafe, a vegetarian Persian restaurant that we really like. 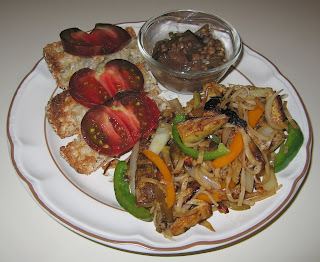 I always get this reduced pomegranate - tempeh dish - it's great! We thought that we would take a try going there with our lovely 1-month-old baby. I was nervous that she might cry - we really don't want to impose and bother others. But our baby really doesn't cry much, mainly when she's hungry, and we fed her right after the appointment. She did great and mostly slept! She started to cry twice, but we held her and she stopped. The restaurant staff treat us very well and have witnessed the pregnancy and even our stopping there for take-out the night that my wife's water broke, as it was getting late and we had to get home, get some rest, and then ended up not unexpectedly giving birth early the next morning. It's exciting that we have this window before the baby crawls to, to some extent, enjoy dining out and cultural events, with baby tagging along. Tonight, I simply heated some black-eyed peas that we had picked up a few days ago at the temple where my parents had organized a dinner in our baby's honor. I also made potatoes O'Brien from a frozen mixture. 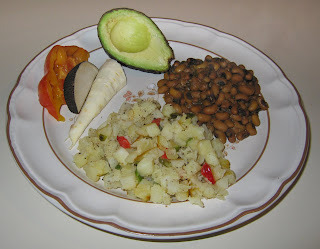 We enjoyed eating black radish and turnip, as well as avocado and heirloom tomato. We bought more great soup from our local soup-maker Melissa; this weekend she made Tomato, Root Vegetable, and Wild Rice Soup. and a Lentil, Chestnut, and Fennel one. Regarding the latter, she had described its production as "a labor intensive venture" that she thinks came out as one of her best soups. 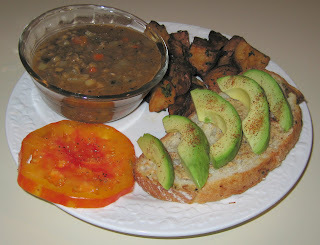 I served her lentil soup with some lemon herb potatoes from Whole Foods Market and avocado slices on yummy lemon sourdough bread. 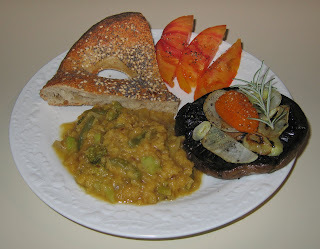 I used a gourmet mustard, California Harvest brand of Green Olive and Lemon Mustard with Roasted Garlic, on the bread. Wow, Melissa's soup was excellent! 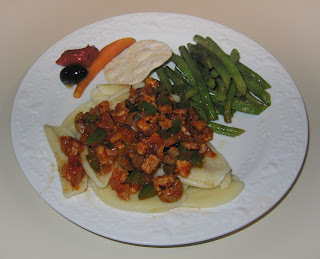 It had a lot of subtle flavors, and that fennel really subtly contributed to the taste. It has been years since I have cooked with fennel, and I should explore using it in my dinners. We picked up another one of the soups from the local soup maker named Melissa. 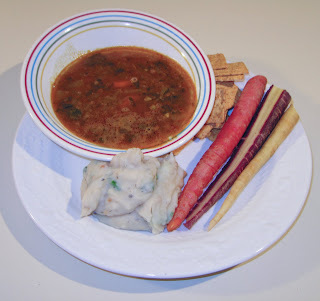 I have been bad since our baby was born in November in keeping my blog updated, and am making this post on January 25, so don't remember the tasty details (but do know that we've loved all of her soups! ); I think the potatoes were lemon herbed ones from Whole Foods. Weaver Street Market had today a specialty bread that resembles a pretzel in form but is a lot like their seeded ciabatta in composition. It was very good! I assume that it will somewhat hard after a half day or so, so bought half a round and served it all with dinner tonight. Frankly, I am making this entry in "catch up mode" on January 25, so please forgive a sketchy description from memory of the meal. 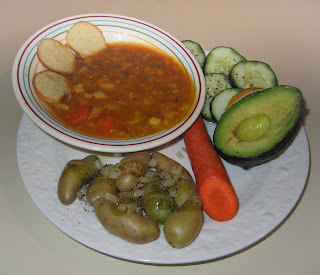 I made some sort of lentil dish with vegetables, making it nice and thick to be like a stew. I also grilled a portabello mushroom. I remember our enjoying this meal! Yikes, it's still hard to believe that we are parents! 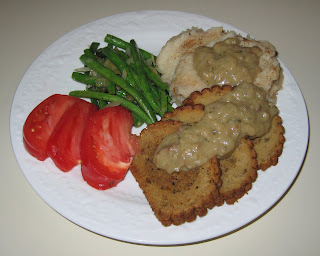 To celebrate that and the new year, we enjoyed the simple and tasty Field Roast Grain Meat Company's Celebration Roast, along with a chunky gravy. I used a commercially available vegan gravy packet that had to be stirred into boiling water and cooked down, and mixed in chunks of chestnuts. I also made mashed potatoes with paprika and green beans. Happy New Year!! May it be one filled with peace and positivity for all! Yesterday was my birthday and we had brought home some south Indian food. 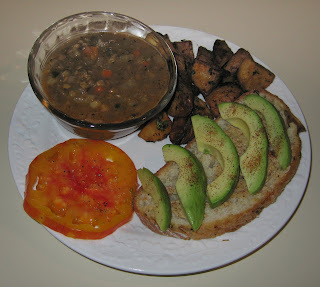 We were up-in-the-air tonight about taking our so-cute little baby out for her first vegetarian society outing, a pizza party, but it was particularly cold tonight, so I just put together a simple meal out of yesterday's leftovers plus squash from a few days ago. Shortly before putting dinner on the table, a vegetarian society friend called who had had an accidental fall requiring a short visit to the hospital tonight, so she was back home and missed the pizza party, as well. We invited her to join us - she shared our meal and also rang in the new year at my parents'. Happy 2009! !